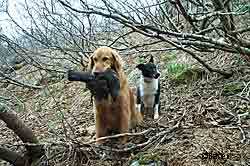 Tater with a blue grouse. Another advantage of early season hooter hunting is that the undergrowth has not become impassable. In June this spot will be an almost impenetrable thicket. Photo by Neil Barten. As the days lengthen and snow melts from the ridges in Southeast Alaska, the booming mating call of the male blue grouse carries through the forests, luring hunters into the woods. How hard can it be to hunt a bird that’s calling to you? Almost impossible, I learned. Blue grouse or hooters are sometimes dismissed as “dumb” birds, but that’s not my experience. My first attempt at spring hooter hunting a few years ago left my buddy and I feeling dumb, while the hooters mocked us from the trees. We headed into Sheep Creek Valley south of Juneau about noon, figuring we’d follow the hooting calls to the birds. A half-dozen males were in earshot, calling with that low-frequency, blowing-across-a-cider-jug tone that’s distinctive of blue grouse. We pinpointed a likely candidate that sounded like he was just a few hundred yards upslope and started climbing through the dense spruce and hemlock forest. A half-mile later we were still climbing. It wasn’t that the bird was moving away, we just couldn’t seem to close in. We traversed, climbed, split up and regrouped, and never did locate a grouse. Most grouse hunters in Alaska pursue birds in late summer and early fall. But the season for blue grouse in Southeast Alaska runs through the winter and into the spring, closing May 15. So grouse hunters in Southeast Alaska have the opportunity for a spring grouse hunt, when the males are hooting. With some legwork and a little more know-how than I had on my first try, spring grouse hunting can pay off. At three to three-and-a-half pounds, blue grouse are Alaska’s biggest grouse. These chicken-like birds are closely related to ptarmigan and Alaska’s other grouse representatives – spruce, sharp-tailed and ruffed. Blue grouse or “hooters” live in the rain forests of Southeast Alaska – an environment very different from the aspen and birch forests favored by ruffed grouse in Interior Alaska and on the Kenai Peninsula. Aside from a few ruffed grouse in some of the mainland river valleys and an isolated population of spruce grouse on Prince of Wales Island, blue grouse are the only grouse found in Southeast – although blue grouse are absent from Prince of Wales. The birds may be found in the spruce and hemlock forests at lower elevations, and at the fringes of muskeg meadows, but generally they favor the upper reaches of the timbered slopes near the subalpine. The grouse and ptarmigan hunting season in Southeast opens Aug. 1, so early season hunters are generally climbing to about 2,000 feet to hunt the upper reaches of the treeline and the subalpine. In the relatively open country of the subalpine, blue grouse often seek shelter in thickets of scrubby, low-lying mountain hemlock. In this country, it’s possible to find ptarmigan and grouse in the same bush. Goshawks also hunt this country, and thickets provide important cover for game birds from those raptors. The birds may be hidden, but it’s often possible to hear them clucking and calling back and forth. It pays to stop and listen for birds at promising patches of cover. Blue grouse may be found in the same areas near the timberline week after week, and hunting timbered ridges in good habitat can mean scaring up a bird every 15 or 20 minutes. They generally do not fly far when flushed, and it’s often possible to see where they land. When the snow flies in the fall, grouse tend to move downslope. They winter in the forest, feeding on spruce and hemlock needles. The males begin hooting in mid-March. Hunters in pursuit of these birds find that the hooting is encouraging, but deceptive. The birds are obviously out there, but exactly where are they? The low-frequency hooting has a ventriloquist effect that makes it hard to pinpoint. To make matters more confusing, the bird needs only to turn his head and hoot in a different direction, and it sounds as if he’s flown to another tree. A few tips can help. 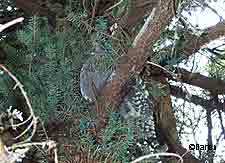 The hooter is generally near the trunk of the tree, not out on the limb, and may be partially obscured by branches. Don’t look for an entire bird, look for something that’s a little out of place against the bark, branches and sprays of evergreen needles. Watch for subtle movement. Blue grouse tend to bob rhythmically when they hoot. If you broaden your eyes, scanning with your peripheral vision as well, it’s possible to catch sight of that slight, jerky movement and then zoom in. The speckled plumage of the blue grouse is good camoflauge in the hemlock and spruce rain forest of Southeast Alaska. Photo by Neil Barten. 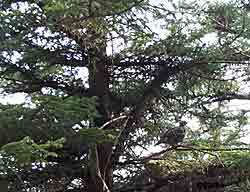 Hooters tend to favor hemlock over spruce trees. Biologist Neil Barten, an avid hooter hunter, says they even favor specific trees. The Southeast rain forest is dense, and one advantage to hunting blue grouse with a partner is bird retrieval. A shot bird may drop into the undergrowth and disappear. Before taking a shot, position a spotter below the tree, keeping a sharp eye on the bird, and retrieve it when it falls. A dog may prove useful here as well. Like spruce grouse, hooters are sometimes considered dumb because they will tolerate a close approach, as in, “That dumb bird let me walk right up to it before it flew off.” But their speckled, slate-blue and grey plumage is good camouflage in the spruce and hemlock trees, and in most cases, it probably pays for the birds to sit tight and let predators walk past. And many predators, such as great horned owls, don’t hear low-frequency sounds as well as humans, so that hooting mating call doesn’t betray the grouse. After that first unsuccessful day, I gave up hunting hooters for a while. I’ve since watched them in the summer in the subalpine and developed a better sight picture to help me key in on them. While hiking last spring, I even managed to track several hooting grouse right to their hooting trees. This spring I expect to have better luck hunting.